Thus, Fort Bragg bears the name of a brave, resourceful, fighting man...A soldier who saw action in three wars and won distinction in each of them. Location. 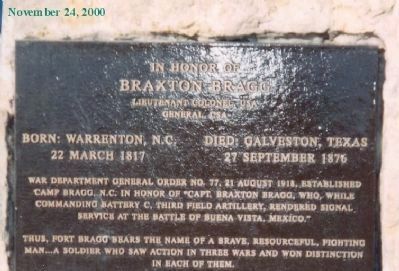 35° 9.162′ N, 78° 58.182′ W. Marker is in Fort Bragg, North Carolina, in Cumberland County. Marker is on Randolph Street west of Bragg Boulevard (North Carolina Highway 87). Touch for map. Marker is in this post office area: Fort Bragg NC 28307, United States of America. Touch for directions. Other nearby markers. At least 8 other markers are within 3 miles of this marker, measured as the crow flies. Fort Bragg (a few steps from this marker); Bastogne Gables (approx. 1.1 miles away); Iron Mike (approx. 1.2 miles away); DC-3/C-47 "Skytrain"
from The Biographical Dictionary of America, 1906, by Rossiter Johnson. (approx. 2.1 miles away); Airlifter's Memorial (approx. 2.1 miles away); Pope Airmen Memorial (approx. 2.1 miles away); C-119 "Packet" (approx. 2.1 miles away); Pope Air Force Base Air Park (approx. 2.1 miles away). Touch for a list and map of all markers in Fort Bragg. More. 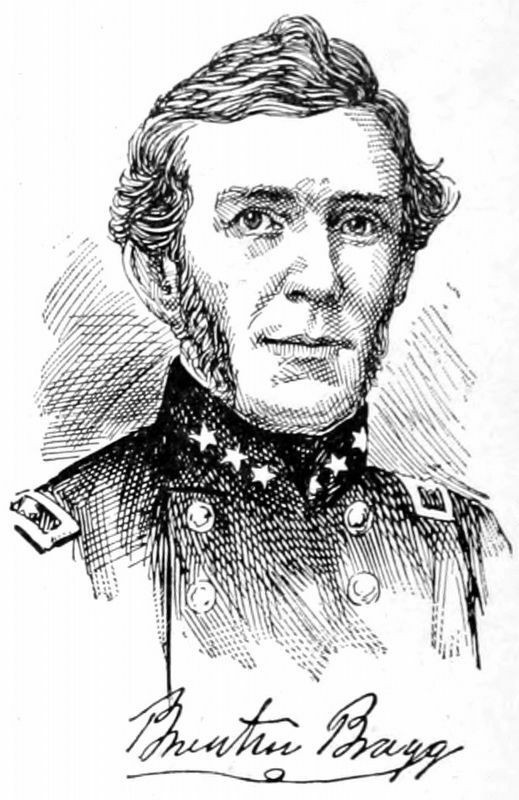 Search the internet for Braxton Bragg. Credits. This page was last revised on June 19, 2018. This page originally submitted on January 10, 2013, by Don Morfe of Baltimore, Maryland. This page has been viewed 441 times since then and 8 times this year. Photos: 1. submitted on January 10, 2013, by Don Morfe of Baltimore, Maryland. 2. submitted on June 18, 2018, by Allen C. Browne of Silver Spring, Maryland. • Bernard Fisher was the editor who published this page.